So in the last few months, I have heard a lot about interactive notebooks in the grade-level classroom. Out of curiosity, I clicked on a few listings on Teachers Pay Teachers to check them out. I found math and language arts notebooks, and thought, "Eh, I don't think this could be adapted for the music classroom." Let's face it, we get so little time with them as it is, how would we have time for notebooks too? Then a few weeks ago, I found this blog post on the TpT site, through the newsletter, and again read it out of curiosity. There were some interesting points about how using notebooks helps deepen understanding and makes the learning individual to each student, so I again pondered what that might look like in the music classroom. With as much active music making I want for my students, I can see it being hard to work in notebooks--especially with the cutting and pasting involved--but I reasoned that if the notebooks weren't used every time that they could be used effectively. But before I go any further, I should probably talk about what interactive notebooks are, because it took me a while to figure that out! I understood that they were notebooks that each child had (and in a music classroom, students could probably keep their notebooks in a crate or some kind of bin) but I didn't quite understand what was interactive about them. I bought a language arts interactive notebook just to further understand, and that only confused me more, because the set I bought just seemed to be worksheets that were small enough to cut out and paste down into a notebook. So I explored more and found that just like anything, there is a huge variety of interactive notebooks, from worksheets that you paste down to foldables, to a mix. (For a math sample, click here.) Students would cut the sheets out, glue them down, and sometimes would also cut flaps so they can write answers beneath. So why use interactive notebooks in the music room? I thought long and hard about this. As stated above, I worried that there would simply be not enough time and not worth the cutting and gluing. But I did come up with some solid reasons why I wanted to try them in my own classroom. 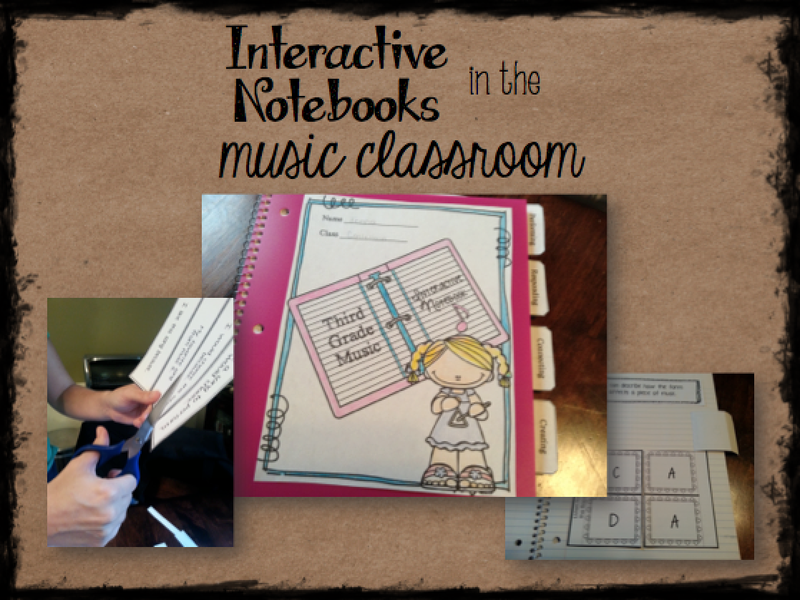 Here are my top five reasons to use interactive notebooks in the music room. 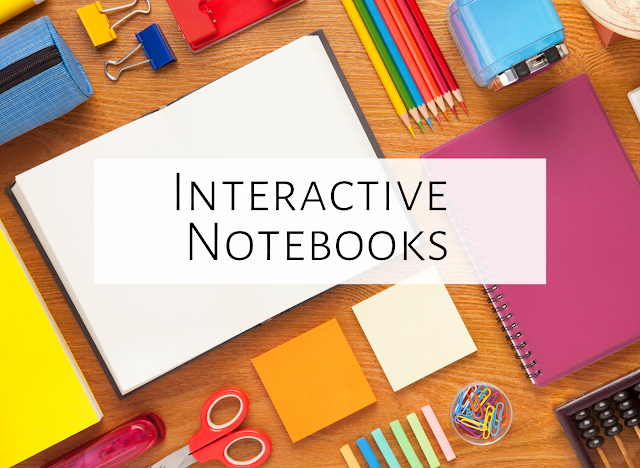 #1: Interactive notebooks are fun! My two-year-old Macy loves books that have flaps that you can lift to see beneath. 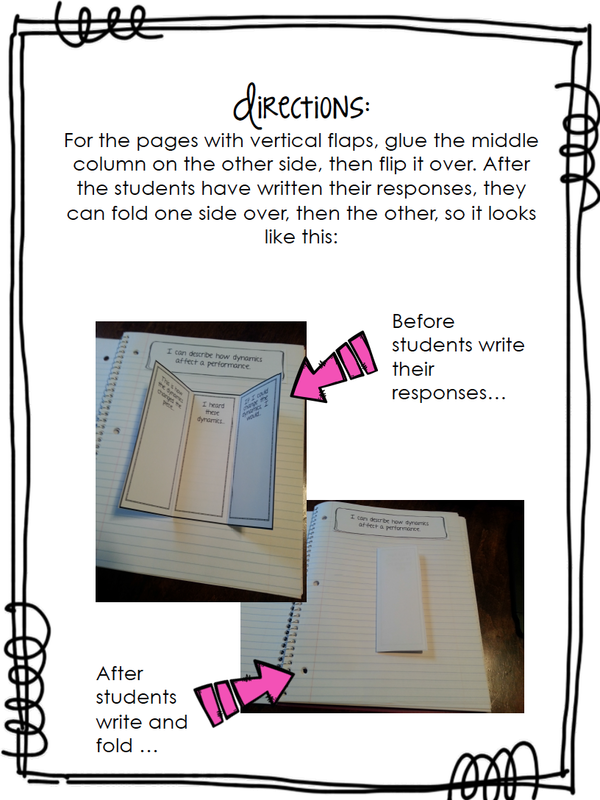 This is actually quite similar to interactive notebooks! It's a twist on the traditional worksheet. The NCCAS standards are a bit overwhelming to many of us (I wrote a blog post about that here.) How do we go about having students making thoughtful decisions about what to perform, or how to reflect on a composer's intent? The notebooks could provide that opportunity--instead of just having a whole-class discussion, you could provide students with the chance to write down their thoughts about some deeper-level questions and topics. 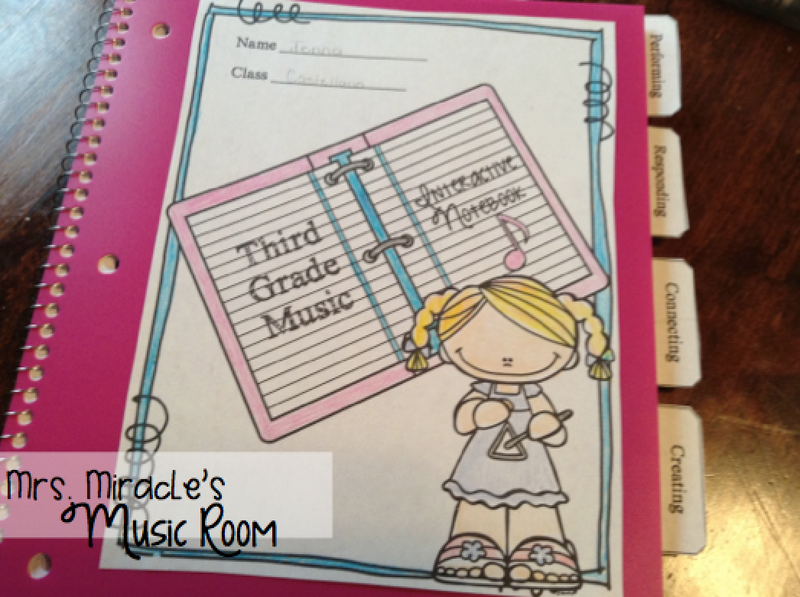 I've heard many stories of music teachers being forced to include writing journals into every music lesson. 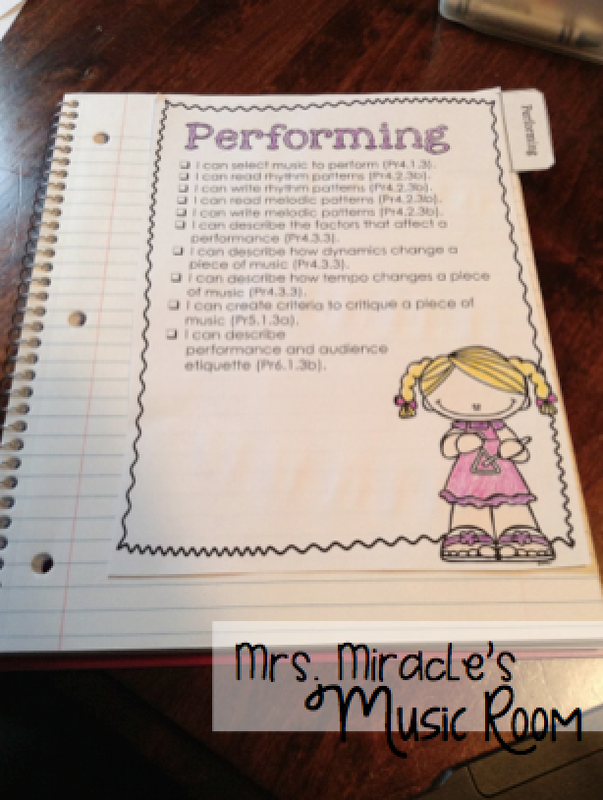 I've often rolled my eyes and groaned at these stories (and I still don't think it's right to force a music teacher to have students write in journals; this should happen organically, when students are ready for the learning, and when the teacher deems it appropriate...but that's a whole other blog post!) However, using interactive notebooks as a way for students to journal is a great way to deepen understanding and to connect language arts with music. Having a notebook that students use the whole year can help students remember what we've covered and where we are going. Students might also see answers they want to change or answers they want to elaborate on once they have a deeper understanding! Last year, I read a great book called "Assessing the Developing Child Musician: A Guide for General Music Teachers" by Timothy Brophy. One of the chapters discussed having a portfolio of student work. I loved that idea, but the logistics of that seemed very difficult to me. Would I sort everything into file folders? Would I be up to my ears with filing? The notebooks could be used as a sort of portfolio, organizing much of the work for the year into one notebook. Many of the pages could be used as formative and/or summative assessments, and could track students' learning throughout the entire year. Thanks to my daughter Jenna for helping to color and paste...she had lots of fun! I had read on another blog post by a classroom teacher that divider tabs were helpful, so I divided my notebook up into the four NCCAS strands: Performing, Responding, Connecting, and Creating. I am only now starting my journey with interactive notebooks, so I am not claiming to be an expert. As I continue on the journey, I will add more grade-level sets to my TpT store and will continue to tweak and add. I will also blog more about how to put together notebooks (without taking loads of time to cut and paste! ), how to store, and how students deepen their understanding through the use of interactive notebooks. 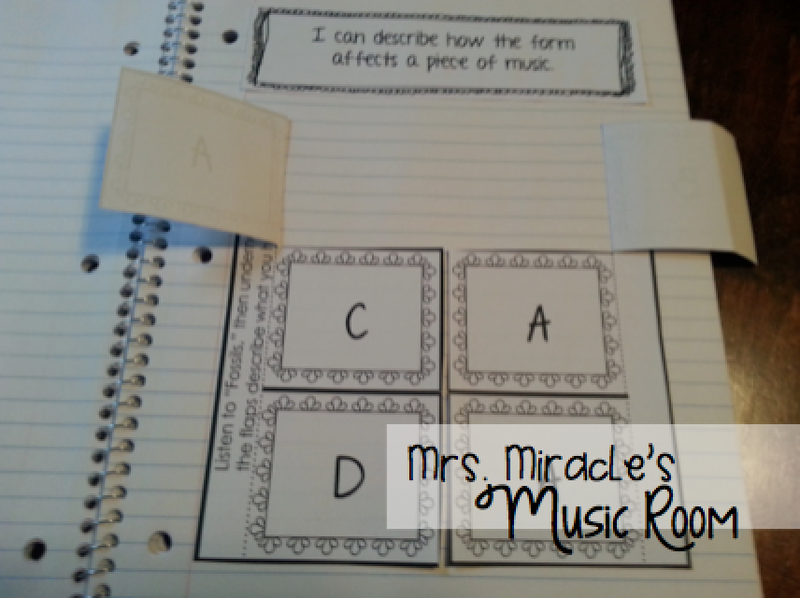 Do you use interactive notebooks in the music room? Please comment below with any suggestions or questions! I've thought about using them before, but only have 30 minute class periods, and with passing between specials it is usually reduced to about 25 minutes. I think they are great idea for someone like you with 50 minute class period! I am definitely going to have to think on the idea of interactive notebooks to check for and deepen understanding, but I would really have to think about how much time would be spent cutting/pasting. That can take a while for some kiddos. I can't wait to hear how it goes in your classroom! Looking forward to reading more! Thanks, Lindsay! Yes, I think the 50 minute blocks definitely make interactive notebooks easier to do. I'm wondering about possibly setting up interactive notebooks while the students have a sub...that way, any sub can do it (even if they are not musicians) AND I get a lot of the cutting and pasting out of the way. We will see! Thanks for mentioning my blog post. I'm glad you found it helpful! I love your idea for adding tabs. I hadn't thought of that, but it makes sense for showing evidence of learning with the new standards. Thanks for sharing! This is a great idea! I'm going to have to try this. We have a huge writing initiative on our campus this year and I think this might fit the bill. I love the idea of having a sub be in charge of the cutting out and gluing stage, so we could get down to business faster. Thanks! Thanks for these great ideas! I've been toying with this for awhile, but have also been concerned about time issues, although I do have 45 minutes. My plan was to start them in 4th and 5th this year, but I haven't gotten it off the ground yet! Ha. I was inspired by Emily at The Sweetest Melody. 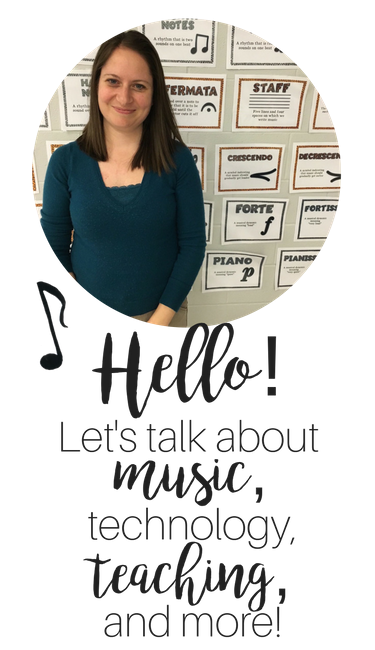 She's been doing interactive notebooks in the music room for a few years and has lots of useful information on her blog. I think you are off to a great start, Aileen! I love how you included a check list or "I cans" for each tab. I'll can't wait to see what else you have in store for the notebooks :-) I think your students will love putting their notebooks together and seeing how many things they they can check off. You are setting them up for success! Has anyone considered using them as a long term growth portfolio? I see students PreK-3rd grade. I'm wondering about starting them with my K kids (few entries a year), then collect them at the end of the year, and re-distribute them when they get to 1st grade, etc. etc. I LOVE THE IDEA of the sub setting up the notebooks! WOOHOO! I love the idea of redistributing them! You'd just have to make sure you have enough pages for all the years you want to use them. Thanks for the creative suggestions! With much kicking and screaming, I started using portfolios with my high school choir last school year, because our admin insisted. I am a believer and have continued and expanded the use for this year. My portfolio is more of a "collection" of resources, handouts, note taking, vocabulary and reflection. Thank you for your post and I plan to check out your TpT resources! Aileen, how did you go about getting a notebook for each student? I have 125 students minimum in each grade level. Even at a quarter a piece that's $30. Did you ask parents to send in notebooks or did your admin help you out, or did you just buy them yourself? This post was really helpful Aileen! I have a small BI class this year and have been thinking about different activities I could do with them. Thanks for the info! !